This post is not about string theory. The goal of this post is much more limited: it’s to give you a better understanding of why the metaphor of the string is so appealing. Let’s recapitulate the basics by see how it’s used in classical as well as in quantum physics. That the wavelengths of the harmonics of any actual string only depend on its length is an amazing result in light of the complexities behind: a simple wound guitar string, for example, is not simple at all (just click the link here for a quick introduction to guitar string construction). Simple piano wire isn’t simple either: it’s made of high-carbon steel, i.e. a very complex metallic alloy. In fact, you should never think any material is simple: even the simplest molecular structures are very complicated things. Hence, it’s quite amazing all these systems are actually linear systems and that, despite the underlying complexity, those wavelength ratios form a simple harmonic series, i.e. 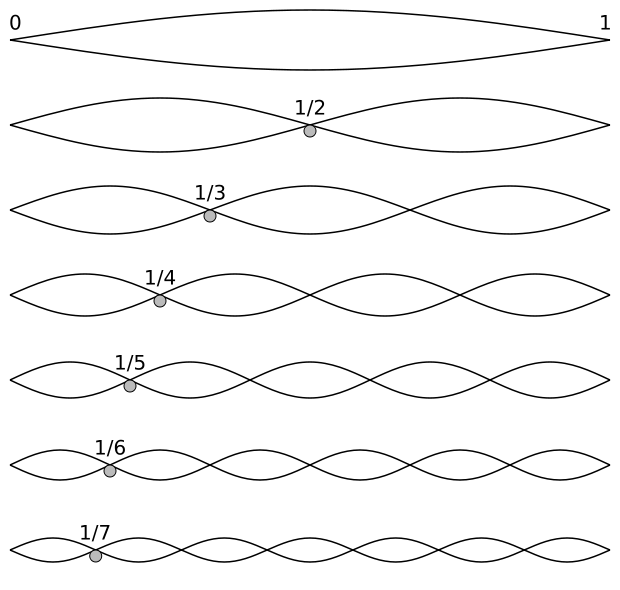 a simple reciprocal function y = 1/x, as illustrated below. A simple harmonic series? Hmm… I can’t resist noting that the harmonic series is, in fact, a mathematical beast. While its terms approach zero as x (or n) increases, the series itself is divergent. So it’s not like 1+1/2+1/4+1/8+…+1/2n+…, which adds up to 2. Divergent series don’t add up to any specific number. Even Leonhard Euler – the most famous mathematician of all times, perhaps – struggled with this. In fact, as late as in 1826, another famous mathematician, Niels Henrik Abel (in light of the fact he died at age 26 (! ), his legacy is truly amazing), exclaimed that a series like this was “an invention of the devil”, and that it should not be used in any mathematical proof. But then God intervened through Abel’s contemporary Augustin-Louis Cauchy 🙂 who finally cracked the nut by rigorously defining the mathematical concept of both convergent as well as divergent series, and equally rigorously determining their possibilities and limits in mathematical proofs. In fact, while medieval mathematicians had already grasped the essentials of modern calculus and, hence, had already given some kind of solution to Zeno’s paradox of motion, Cauchy’s work is the full and final solution to it. But I am getting distracted, so let me get back to the main story. More remarkable than the wavelength series itself, is its implication for the respective energy levels of all these modes. The material of the string, its diameter, its tension, etc will determine the speed with which the wave travels up and down the string. [Yes, that’s what it does: you may think the string oscillates up and down, and it does, but the waveform itself travels along the string. In fact, as I explained in my previous post, we’ve got two waves traveling simultaneously: one going one way and the other going the other.] For a specific string, that speed (i.e. the wave velocity) is some constant, which we’ll denote by c. Now, c is, obviously, the product of the wavelength (i.e. the distance that the wave travels during one oscillation) and its frequency (i.e. 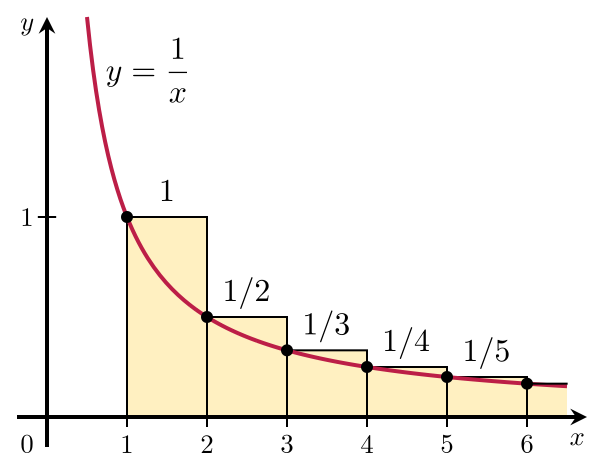 the number of oscillations per time unit), so c = λ·f. Hence, f = c/λ and, therefore, f1 = (1/2)·c/L, f2 = (2/2)·c/L, f3 = (3/2)·c/L, etcetera. More in general, we write fn = (n/2)·c/L. In short, the frequencies are equally spaced. To be precise, they are all (1/2)·c/L apart. This formula is exactly the same as the formula used in quantum mechanics when describing atoms as atomic oscillators, and why and how they radiate light (think of the blackbody radiation problem, for example), as illustrated below: En = n·ħ·ω = n·h·f. The only difference between the formulas is the proportionality constant: instead of a, we have Planck’s constant here: h, or ħ when the frequency is expressed as an angular frequency. This grand result – that the energy levels associated with the various states or modes of a system are equally spaced – is referred to as the equipartition theorem in physics, and it is what connects classical and quantum physics in a very deep and fundamental way. Just think about it for a moment: what I am writing here is E0 = 0, E1 = 1, E2 = 2, E3 = 3, E4 = 4, etcetera. Isn’t that amazing? I am describing the structure of a system here – be it an atom emitting or absorbing photons, or a macro-thing like a guitar string – in terms of its basic components (i.e. its modes), and it’s as simple as counting: 0, 1, 2, 3, 4, etc. Let me conclude by saying something more about a. What information does it capture? Well… All of the specificities of the string (like its material or its tension) determine the fundamental frequency f and, hence, the energy levels of the basic modes of our string. So a has nothing to do with the particularities of our string, of our system in general. However, we can, of course, pluck our string very softly or, conversely, give it a big jolt. So our a coefficient is not related to the string as such, but to the total energy of our string. In other words, a is related to those amplitudes a1, a2, etc in our F(t) = a1sin(ωt) + a2sin(2ωt) + a3sin(3ωt) + … + ansin(nωt) + … wave equation. How exactly? Well… Based on the fact that the total energy of our wave is equal to the sum of the energies of all of its components, I could give you some formula. However, that formula does use an integral. It’s an easy integral: energy is proportional to the square of the amplitude, and so we’re integrating the square of the wave function over the length of the string. But then I said I would not have any integral in this post, and so I’ll stick to that. In any case, even without the formula, you know enough now. For example, one of the things you should be able to reflect on is the relation between a and h. It’s got to do with structure, of course. 🙂 But I’ll let you think about that yourself. This entry was posted in Physics and tagged atomic oscillators, classical versus quantum physics, equipartition theorem, Feynman, fundamental modes, modes, normal modes, Penrose, Planck constant, quantum and string theory, quantum of energy, Road to Reality, smallest energy unit, smallest time unit, smallest unit of energy, smallest unit of time, string theory, structure of the Universe. Bookmark the permalink.